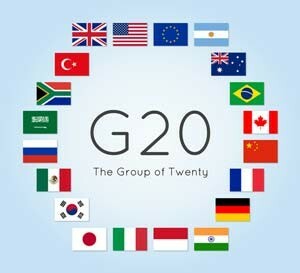 Today's stock market news is highlighted by the upcoming G20 conference. Finance ministers and central bankers will gather in Germany today to discuss global economic activity. Don't be surprised if President Donald Trump is a popular topic. On Thursday, the Dow Jones Industrial Average dropped 15 points after President Trump proposed a series of budget cuts in funding for medical research and a massive uptick in regulatory costs for the sector. A downturn in healthcare stocks offset any momentum produced by another round of positive economic data. Here's more on yesterday's downturn. The Dow Jones futures are up 25 points this morning as Wall Street prepares for another busy day of economic data and the beginning of the G20 conference. Traders will be looking for improved metrics in U.S. manufacturing and consumer sentiment after the economy showed positive momentum in the construction market yesterday. On Thursday, President Trump proposed a series of budget cuts in funding for medical research and a massive uptick in regulatory costs for the sector. Healthcare stocks slumped as a result. According to President Trump's budget, the administration wants to reduce spending at the National Institute of Health by 20%. The budget plan also calls for double the amount of regulatory fees to the U.S. Food and Drug Administration from $1 billion to $2 billion in 2018. Crude oil prices were slightly up Friday morning despite news that investors are concerned about growing supply levels around the globe. Traders remain on edge about the stability of OPEC's production supply cuts and the ability of non-member Russia to meet its targeted goals to cap excess output. In addition, the markets will be looking to a report later today from Baker Hughes Inc. (NYSE: BHI) on the domestic rig count. The report will offer a glimpse into whether U.S. production is on the rise. This morning, the WTI crude oil price today added 0.4%. Brent crude gained 0.4%. While everyone is talking about the Trump budget, the real threat to the post-election rally is happening with the debate over the Affordable Care Act. Markets have roared higher since President Trump teased his new tax plan on Feb. 9, which promised to slash corporate taxes by 25%. But with Congress now racing to replace the Affordable Care Act, Money Morning Capital Wave Strategist Shah Gilani worries that could make investors question whether or not the tax cuts will actually come. Here's Gilani's latest insight on what could happen next. Shares of Valeant Pharmaceuticals International Inc. (NYSE: VRX) added more than 4.9% in pre-market hours after hedge fund ValueAct announced it had purchased 500,000 shares of the embattled company's stock. The news comes just days after hedge fund titan Bill Ackman announced he had sold his entire stake in VRX stock and suffered a $3 billion loss on the position. Despite the uptick in VRX stock, investors would be wise to avoid the stock due to its underwater balance sheet and lack of a cohesive strategy. In deal news, shares of MSCI Inc. (NYSE: MSCI) are in focus after a rumor emerged that S&P Global had offered $120 per share for the owner of equity, fixed income, and hedge fund stock market indexes. The company, which denied the rumors, spun out of Morgan Stanley in 2007. Shares of Adobe Systems Inc. (Nasdaq: ADBE) hit a new all-time high after the company easily topped Wall Street earnings expectations after the bell Thursday. Shares added more than 3.5% after the company reported earnings per share (EPS) of $0.94. That figure topped expectations by $0.07 per share. The firm also topped revenue expectations by a reported $1.68 billion for the quarter. Shares of McDonald's Corp. (NYSE: MCD) are in focus after the company's official Twitter Inc. (NYSE: TWTR) account was hacked Thursday. A hacker posted a series of insults about President Trump, again raising concerns about the security of the microblogging site. In earnings news, shares of Tiffany & Co. (NYSE: TIF) are up 3.3% after the company issued its fourth-quarter report before the bell Friday. The luxury jeweler reported earnings per share of $1.45, which topped Wall Street estimates. It also offered a very strong forecast for 2017, pushing the stock higher. Keep an eye out for an additional earnings report from BioDelivery Sciences International Inc. (Nasdaq: BDSI).